The Brewer Riverwalk trail, which runs for almost half a mile along the Penobscot River, will double in size this summer. 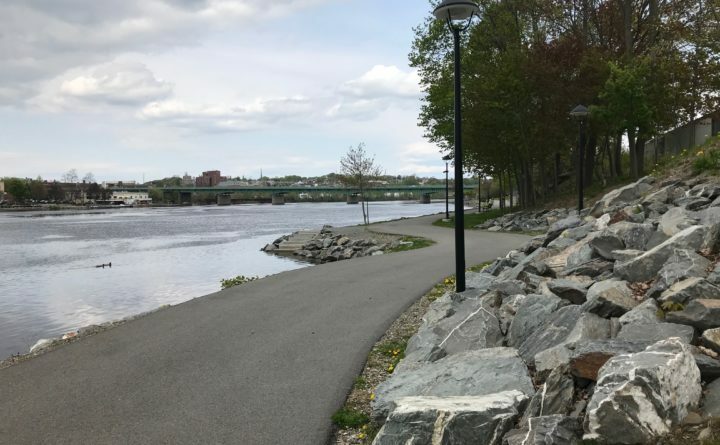 The Brewer Riverwalk along the Penobscot River is slated to double in length this summer, stretching almost an additional half-mile from the Joshua Chamberlain Bridge up to Veteran’s Park. The current stretch of the Riverwalk, which was completed in July 2013, is a little less than half a mile, from Mason’s Brewing Co. to Wilson Street along the Penobscot River. The newest part of the trail will extend approximately the same distance north, under the Joshua Chamberlain Bridge and along the shore to Veteran’s Park on Penobscot Street. Construction is slated to begin this summer once the Maine Department of Transportation awards the winning bid, which likely will happen this month, City Engineer Frank Higgins said. The lowest and likely winning bid from an Ellsworth-based construction company was just under $1.4 million. The city will pay for 20 percent of the project, and the rest will come from leftover federal grant money that was earmarked in 2005, Higgins said. The idea for a riverwalk trail was conceived of by residents and city officials in 2000 as part of a downtown revitalization plan, which included the idea to build a walking and biking trail that runs the length of Brewer’s waterfront. Prior to the trail, the city completed a $4 million shore stabilization project to prevent erosion. In addition to fulfilling part of Brewer’s long-term development plan, “the extension of the Riverwalk will bring more people to the waterfront and in turn into contact with the businesses in that area,” Mayor Jerry Goss said. Beyond the trail itself, the project cost includes aesthetic improvements on Center Street, between North Main and Penobscot streets. “We’re going to replace all the brick sidewalks and the lighting fixtures,” Higgins said. At its May 8 meeting, the Brewer City Council approved paying 10 property owners a total of $2,700 for temporary easements to build and outfit the new sidewalk, as well as payment of $46,250 to four property owners who directly abut the trail extension, according to city documents. Payment for the 14 easements is included in the total project cost, Higgins said. Eventually city officials hope to pave the trail downriver from Hardy Street, near where South Main Street intersects with the northern on- and off-ramps to Interstate 395, Community and Economic Development Director D’Arcy Main-Boyington said. And hopefully one day, Main-Boyington said, residents will have access to a “more primitive dirt trail” connected to the Riverwalk that runs along Felts Brook and encircles the city, through woods and land owned by the Brewer Land Trust, she said.